I have been excited about Shahrukh Khan's latest release "Fan" since I saw its teaser. I remember I copied the teaser in my mobile phone and showed it to almost everyone for the next few weeks whoever said that they haven't watched the trailer of the movie. Later on, when the trailer released just few weeks ago, I repeated the same activity. Such was an excitement for this movie because SRK was finally doing something all of us always wanted him to do- Act seriously in serious movies. So when I went to watch this movie on Second Day First Show, I had lots of expectations. And when I say this, I mean to say that I wanted it to be as special and majestic as PK and 3 Idiots. And because of such high hopes, it all fell down badly. This isn't a movie which you'll want to watch again and again. But surely once because of SRK's special acting performance. Fan is wonderful in the beginning when the character of Gaurav is slowly introduced to us. We start liking him right from his first scene itself and love him until the end even when he turns obsessive and destructive and villainous. His parents are also covered beautifully along with the girl whom he has crush on. The scene when Gaurav gives a performance on stage while his superstar dances on the same steps in background through projected video is one of the best ideas to be implemented since long time. Also, this whole idea of making this movie with a Fan who looks similarly as his idol is also something for which writers and director should be complimented. It's not only difficult to even think about it but also executing it finally. The dialogues in the movie are wonderful. You will find them realistic according to the different characters that are created in this movie. The film disappoints because there's no scene pre-interval where people are mistaken for Aryan when they see Gaurav roaming on road. The scene when the fan meets with his idol for the first time is also little under-whelming as Gaurav doesn't show the same excitement as he shows while leaving Delhi to meet him. It is also dramatic to find a superstar running behind the fan on the streets when he has his own bodyguards who can do task for him. Also people not chasing him down when they find him chasing someone on road. All of this takes away your trust gradually from the movie before it becomes yet another Bollywood movie. 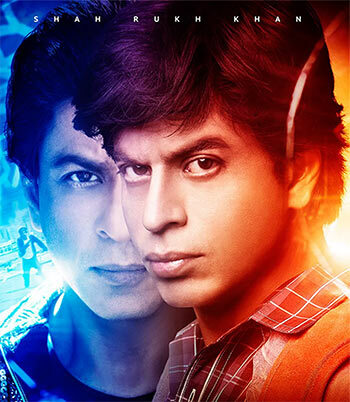 Something for which FAN should be remembered in future years is Shahrukh Khan's effort in portraying such two extreme personalities elegantly in a movie and being flawless when it came to Gaurav's character. This is definitely one of his best performances after a long time and it will be counted in his Top 3 forever. Playing a 25-years old boy at the age of 50 isn't an easy job. The VFX has also played its part perfectly which has made FAN look actually as it was in director's mind from a long time. I give this movie 2.5 stars just because of its displeasing climax and some unrealistic sequences.